Although we do not currently have an education programme for Higher education students, we will happily assist you with planning a visit. "We regularly use the geology of the Torbay area because it contains many excellent exposures of key geological features which are either not exposed in the SW of England, or nowhere near as well exposed, or are deformed by tectonic activity and not so clear. The key locations we use regularly are Roundham head, Paignton (excellent location for introducing facies analysis and logging as well as desert facies associations deposited in alluvial fan, aeolian sand dune and inter-dune ephemeral ponds), Goodrington (fantastic angular unconformity between Devonian slates and sandstone deformed during the Variscan Orogeny and Permian alluvial gravels: this site contains one of the best locations for demonstrating the timing of Variscan deformation in SW England) and Hope's Nose and surrounding exposures (e.g. Meadfoot. Triangle Point). Hope's Nose is perhaps the best place in southern England, south of the Mendips, to introduce benthic palaeoecology, carbonate sediments and carbonate facies analysis. 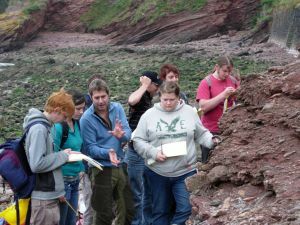 We've also used Berry Head, Babbacombe and Saltern Cove for trips and undergraduate projects in the past. The Torbay area is the only place on the South British coast where the relationship between rocks deposited prior to, and deformed during the Variscan Orogeny can be seen in contact with the rocks of the proto-Wessex Basin (extensional tectonics after the Variscan Orogeny). The only other places where this can be seen are now poorly exposed around the Mendips/Bristol area and in South Wales. Also, the 'Jurassic Coast' WHS only contains Mesozoic and Cenozoic rocks, so it is a bit like studying the history of Britain back to the Tudors, but no further. The Torbay geology extends this back into the Devonian- which are the oldest rocks exposed in Southern England, and the crucial contact between the pre- and post- Permian".